Get Involved with ConserVentures. When we have specific needs, we will post them here, on our Projects page, and through our eNewsletters (sign up at the bottom of this page). 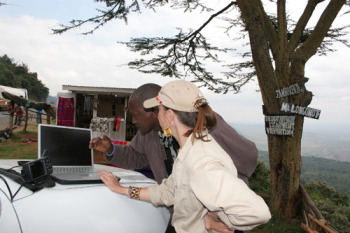 Working with African Conservation Centre in Kenya on mapping the first South Rift Adventure Safari route using donated Garmin GPS and computer. If you have skills you'd like to contribute for one of ConserVentures' supported projects, please fill out the questionnaire below, and we'll get back with you about opportunities on an individual basis.